Photo by David Lockeretz of Nobody Hikes in L.A. Many L.A. hikers know that Southern California has far more waterfalls than meet the eye. However, there are a few that are unknown even to veteran hikers—such as the small one off the Frascati Trail on the Palos Verdes Peninsula. Following recent rains, hikers can see this five-foot cascade and enjoy its musical flow. The Frascati Trail is one of several short ones operated by the City of Rancho Palos Verdes. Only one-third of a mile, it packs in quite a bit of scenery: nice ocean views from the top, a pleasant, shaded canyon at the bottom and the small waterfall. It can easily be combined with several other trails nearby, such as the Siena Loop or the Colinitas Trail, to create a longer hike. Parking is available on the corner of Corsini Place and Palos Verdes Drive East, in the community of Miraleste. From the end of I-110 in San Pedro, take Summerland Avenue west for a mile. Turn left on Western Ave., drive a mile to 9th St. and turn right. Drive 1.3 miles on 9th, which becomes Miraleste Drive. Turn left on Palos Verdes Drive East and head south for 0.3 miles. Take a left on Corsini Place and park in the residential neighborhood. The Frascati Trail begins just off of Palos Verdes Drive East. You head downhill into the canyon, following the switchbacks. After the second hairpin turn, you can reach the waterfall with a short scramble over some rocks, in a cool, shaded grotto. Be careful—the rocks can be slippery. Unfortunately there’s no real place to sit and enjoy the waterfall, but you can still get a pretty good view of it. The trial continues downhill past the grotto, through a shaded canyon. 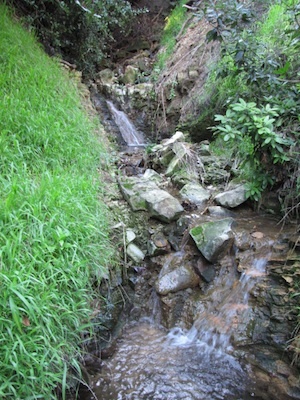 If there have been recent rains, you’ll be accompanied by the pleasant sound of the trickling stream. The lower reaches of the canyon are surprisingly quiet, with much of the noise of nearby traffic blocked out. After a third of a mile, you reach the bottom of the hill, at Via Colinita. Here, you can either retrace your steps or head left on Via Colinta and reach the Sienna Loop, one of the other trails in the area. When rains bring the waterfall to life, it’s certainly a little gem, but no matter what the season may be, the Frascati Trail is a quick and easy escape into nature. It proves that even in the middle of the crowded South Bay, there are still places to get away from it all.